We are pleased to launch the 2018 Seeds for the Future program to include Paid Summer Work-Term. The Huawei Seeds for the Future work-study program offers undergraduate students an opportunity to travel to China for a two-week period. During the first week, participants will be Huawei’s guests in Beijing for an immersive introduction to Chinese language and culture. In week two, participants will stay in Shenzhen and work with the Huawei team in our Global Headquarters, learning about Huawei’s international culture, strategy and values, and receive technical training from some of the finest professionals in the industry. Travel and accommodation will be provided by Huawei. 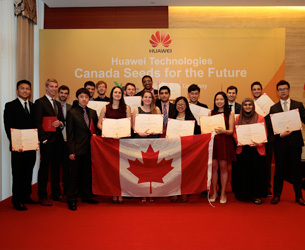 The 2018 Seeds for the Future program will be expanded to include a 14-week paid Summer work-term, where in addition to travelling to China for 17 days in late May, students will have the opportunity to work directly with Huawei’s Canadian research team, while working out of Huawei’s research facilities in Ottawa, Toronto and Waterloo, as well as Huawei’s research partnership programs in Vancouver and Montreal. Watch our video on the life changing experience from the class of 2016. Interested in an unforgettable career changing trip to China? You are a 3rd year Engineering student looking for a life-changing experience. We have partnered with the following universities for the 2017 Canada Seeds for the Future program. They include: University of Ottawa, Carleton University, University of British Columbia, Polytéchnique Montréal, University of Waterloo, University of Saskatchewan, the University of Toronto, Simon Fraser University, University of Calgary and Western University. Applications will be reviewed and an initial selection will be made by University representatives. Final candidates will be selected by an independent jury composed of relevant ICT association, media and industry executives. If you’re interested in this once-in-a-lifetime opportunity, please apply using our convenient online application process. Closing date for applications: March 18, 2018.